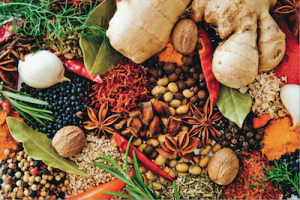 A selection of our products are strongly influenced by the South-East Asian flavours and ingredients of Indonesia, Thailand, Malaysia and Singapore. Dishes from this region are light, aromatic and packed with herb freshness and zesty notes. Coconut is a common base and dairy is rarely, if ever, used. Common ingredients include fresh ginger, garlic, onions, spring onions, galangal, lemongrass, tamarind, turmeric, krachai, kaffir lime, whole fresh coriander, curry leaves, mint, tomato, coconut, turmeric, dried chilli, fish sauce, shrimp paste, palm sugar, peanuts and candle nut. These common ingredients are combined with rice, noodles, tofu, fish, pork, beef, chicken, vegetables and fresh herbs to produce an infinite range of dishes. Popular dishes include nutty satay, coconut-based laksa, light curries, fresh rice or noodle stir-frys and zesty salads. Pastes are often also used to marinade meat or vegetable and to add freshness to western soups and casseroles. To experience the light, aromatic and herb-packed flavours of South-East Asia, try our Indonesian Turmeric Paste, Malaysian Satay Paste, Thai Massaman Curry Paste, Thai Green Curry Paste, Thai Red Curry Paste, Rendang Terlagi Lagi Paste or Singapore Curry Laksa Paste. A selection of our products are strongly influenced by North Indian region of Punjab, Kasmhiri and Haryana cuisine, flavours and ingredients. Dishes from this region are fragrant, mild, nutty and creamy – packed with sweet tomato, creamy dairy and zesty notes. Common ingredients include onion, garlic, ginger, fresh tomatoes, mild tomato paste, chilli powder, chilli flakes, fresh chilli, coriander powder, fenugreek, mint, yogurt, butter, coriander powder, ginger powder, dried turmeric, cumin and fennel powder, paprika and almonds. These common ingredients are combined with rice, noodles, beans, lentils, vegetables, fish, pork, beef and chicken to produce an infinite range of dishes. Classic North Indian is naturally suitable for people who are vegetarians (for example: butter lentils and tandoori potatoes) but not vegans, due to the general presence of dairy. Popular dishes include butter chicken, tikka masala, hearty curries, dahls, marinated roasted meats and vegetables, casseroles and hearty soups. These are the most flexible flavour bases and similar products can be mixed with each other to create new flavours and could be extended to marinade meats to be used in sandwiches, salads and more. To experience the sweet, creamy and deep flavours of North Indian cuisine, try our Butter Chicken Sauce, Tikka Masala Paste and Tandoori Sauce/Marinade. A selection of our products are strongly influenced by the mild to medium flavours North West and Central West India like Rajasthan, Gujarat, Maharashtra, Madhya Pradesh and Uttar Pradesh regions. Dishes from this region are traditional and fresh, spicy, layered, complex, sweet, fruity, creamy, nutty and zesty with a mild to medium heat. Common ingredients include onion, garlic, ginger, fresh tomatoes, fresh green and red chilli, coriander, mint, and fenugreek leaves and lemon. Other ingredients include yogurt, chilli powder, mustard seeds, mustard powder, cinnamon, cloves, star anise, dried coconut, cardamom, ground coriander powder, chilli flakes, ginger powder, dried turmeric, cumin, fennel powder, paprika, almonds and cashews. These common ingredients are combined with rice, beans, lentils, fresh and root vegetables, fruit, fish, lamb, goat and chicken to produce an infinite range of dishes. Popular traditional dishes include biriyanis, saags, roasts, casseroles, curries and kurumas (korma). Regional Indian is great for large-batch cooking and one-pot meals without compromising flavour, thanks to the layered mix of herbs and spices. Traditionally celebratory due to the hours of preparation, these pastes are suitable for inventive home cooks and work with most seasonal bold flavours. To experience the complex and satisfying flavours of North Indian cuisine, try the following chutneys or pastes: Biriyani Masala Paste, Coriander Curry Paste, Kuruma Masala Paste and Rogan Josh Masala Paste. A selection of our products are strongly influenced by the spice and complex flavours of South Indian of Kerala, Goa, Karnataka, Tamil Nadu, Andhra Pradesh and Telangana. Dishes from this region are strong, hot, spicy and layered with complex peppery tones and tangy flavour. The taste and fragrance is bold and pungent. Common whole ingredients include onion, garlic, ginger, fresh tomatoes, fresh green and red chilli, turmeric, curry leaves and coconut flesh. Other ingredients used include mild tomato paste, chilli powder, mustard powder, mustard seeds, fenugreek, cinnamon, cloves, star anise, dried coconut, cardamom, coriander powder, chilli flakes, ginger powder, dried turmeric, cumin, fennel powder, paprika and almonds. These products are naturally suitable for vegetarians and coeliacs and endorsed by Coeliac Australia. Popular traditional dishes include Madras, vindaloo and infinite variations of home-style curries. To experience the flavours of hot regional Indian, try the following chutneys or pastes: Zingy Tomato Chutney, Eggplant Kasaundi Chutney, Green Coriander Sauce, Date and Tamarind Chutney, Homestyle Curry Paste, Vindaloo Masala Paste, Madras Curry Paste and Homestyle Seafood Curry Paste. The Australasian influence has borne a range of relishes, dressings and chutneys that naturally compliment Indian and Australian foods – whether it be a platter for friends or a lunch or snack for yourself. The flavours are mild to hot, often sweet, earthy but fresh and often sour and tangy. Whole, natural and fresh ingredients include onions, garlic, green chillis, jalapeno, parsley, coriander, oregano, lemon, orange, beetroot, cherries, horseradish, mustard, vinegar, brown sugar, raw sugar and extra virgin olive oil. These products are naturally suitable for vegans, vegetarians and coeliacs and can be used to create new flavours in many ways including dips, marinades, platter foods, salads and stirfrys. To experience the Australasian influence, try the following products: Beetroot Horseradish Relish, Jalapeno Onion Relish, Red Chilli Onion Relish, Orange Chimichurri & Jalapeno Relish, Green Chimichurri Sauce/Marinade, Cherry Chocolate, Caramelised Balsamic Vinegar, Caramelised Apple Cider Vinegar and Chilli Oil.